We have classes the 2nd and 4th Tuesday afternoons each month, 1:30pm to 3pm, with setup at 1pm. Classes are held in the cafeteria at: Encompass Health Rehab Hospital 325 S Parkside Dr.
Everyone is welcome to come visit or help!!! Just check in with the receptionist and tell her you are here for the art class. Someone will direct you to us in the cafete-ria. Our classes are offered through the Brain Injury Alliance Colorado. Their offices are in Denver but they are working with Encom-pass to bring classes to those interested in Colorado Springs and Pueblo. We do need more helpers and teachers. Please come see what it is all about. Feel free to visit with Terry Niznik anytime. It is a wonderful way for us to give back to the community. BRING YOUR IDEAS & SHARE YOUR LOVE! Memory boxes are given to the parents that have lost their newborn. It gives them a special box to carry their few mementos of their lost little love. St. Francis: They can use the small Memory box-es for labor delivery fetal loss or pre-op. One Chap-lain said she thought butterflies were very appropri-ate especially for the little boxes. I have several stencils that will make painting them much quicker. Memorial Hospital: Good News. Memorial wants to partner with us with the memory boxes. They like the mid-sized boxes as they include several small items for the family. The star shaped boxes do not work as well due to the plaster of Paris footprint they include when possible. They can also use the small boxes. They would also like to acknowledge our Chapter donations in their newsletter. If you have completed boxes, Maddie can pick them up or you can bring them to the next Chapter gathering and they will be delivered to Memorial when we have several ready. View the PDF presenting the wonderful auction pieces here. Download a PDF file that has all the photos and info for this auction. 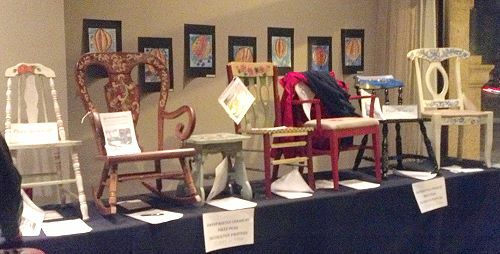 Pikes Peak Decorative Painters were the featured Artists with 25 hand-painted chairs as part of a silent auction to help raise funds for The Colorado Springs Conservatory and PPDP. $2,400 was raised from our chairs! Take a look at the chairs in the PDF linked below to see the chairs that were painted for this event! 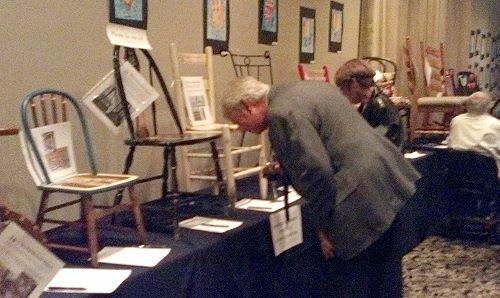 The auction was held along with the 7th Annual Koats 4 Kids Fundraising Party on Friday, October 4th at the Mining Exchange Hotel. 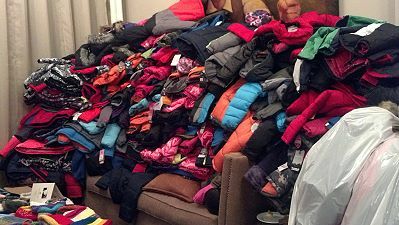 It was a fabulous party, and this year over 500 new winter coats for the students at Centennial Elementary in Harrison School District 2 were collected. 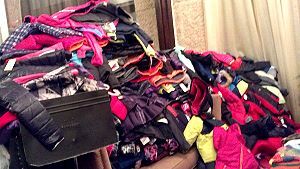 It's a whole lot easier to learn when you're safe and warm and all the kids at the school will be taken care of with coats! 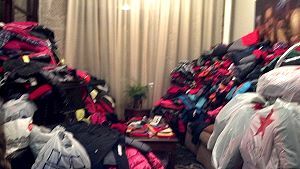 Check out the piles of coats that were collected! See the chairs that we painted. For all details and information click here for a PDF you can save, and/or print out. The file is large so give it time to load. Chapter photographs of past butterflies are available by clicking the chapter photos link. As you can see Pikes Peak Decorative Painters enjoys giving back to our community. We also contribute to the community be doing random service projects. For example, painting items to be auctioned off by the policemen's wives or painting a toy box for the police station where our meetings are held.